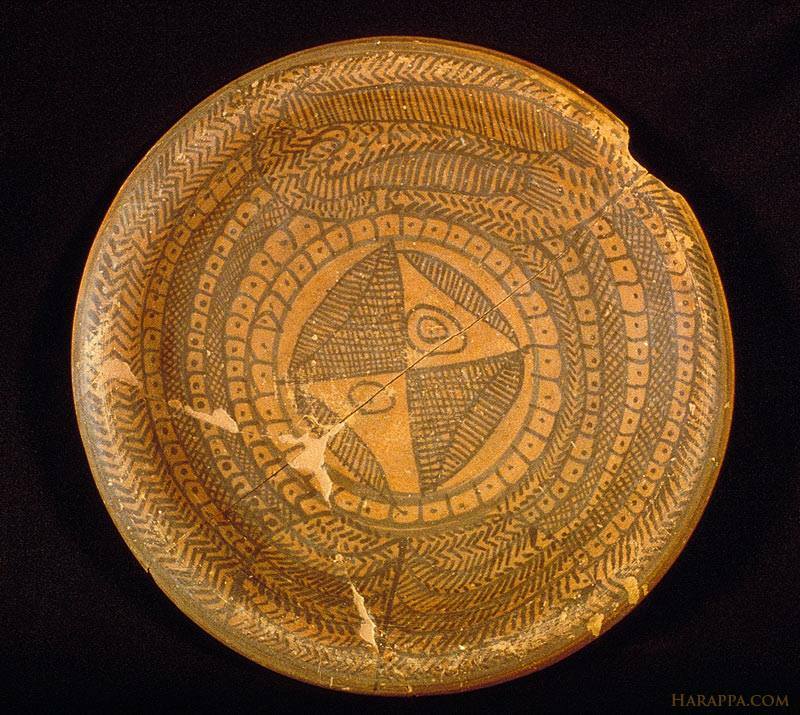 A painted dish of a pedestaled vessel from Harappa found in 1993. The painted design includes two peacocks and a sacred tree. Mark Kenoyer writes: "Painted dish portion from a dish-on-stand. The black-on-red painted decoration is arranged in panels that are divided into four sections. Two peacocks are depicted on one side, and a many-branched tree with short leaves is painted on the opposite panel section. Between these two motifs are multiple lines of loops with circle-and-dot designs and hatching which totally fill all of the empty space. In the center of the dish is a geometric design with a single circle-and-dot motif on one side and a double circle-and-dot motif on the opposite side. All of the decorations on this dish undoubtedly had specific ritual and symbolic meaning, possibly relating to fertility, good health and good fortune. Originally part of a dish on stand, this elaborately painted dish may have been removed from the broken base and reused. It was found in the room of a house on the recently excavated Mound ET" (Ancient Cities, p. 324). See also Fuchsite Drinking Glass .